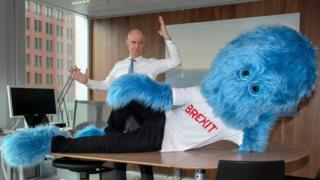 The Dutch government sees Brexit not as the elephant in the room but as a giant Muppet-style monster lying on a desk. That is the picture tweeted by Foreign Minister Stef Blok, with the warning: “make sure Brexit doesn’t sit – or lie – in your way”. There is a link to an official website where Dutch firms can see the potential impact of Brexit on their business. The Netherlands is among the UK’s top trading partners, and Dutch officials say Brexit could deliver a major blow. There is much speculation that the UK could leave the EU without a deal on 29 March – seen by many as the worst-case scenario. Dutch hospitals have warned that a sudden UK exit could cause shortages of medicines and other medical supplies. But the furry monster is an effort to lift some of that doom-and-gloom, at least for the Dutch. The monster is already a hit on Twitter. The government is also running radio ads to warn Dutch businesses about the looming impact of Brexit.